Hershey is an awesome dog he is beautiful to look at and amazing to watch. I have never witnessed a dog more birdie then Hershey. He has a huge, huge, huge motor that will not quit he has always been full bore. He is an incredible marker and offers a hard tripod point sometimes out at 30 yards with a nose that is unbelievable. He just doesn't miss a bird. He was a bit immature in 2016 failing two master tests one by taking the diversion bird and the other he caught a bird in the upland portion with 30 seconds left on the clock. 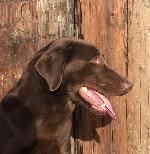 In 2017 will plan on finishing his 4x Grand Master Pointer Retriever title with the APLA and his HRCH with the Hunting Retriever Club. 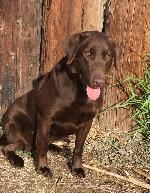 Hershey is our daughters chosen hunting partner, he has always been a loving, gentle, house friendly, and great with children dog, but intense in the field. Take a look at some videos on our website.